OSWEGO – St. Francis Commons Assisted Living Residence in Oswego celebrated its first anniversary to the sound of “popping” champagne corks during a special luncheon for residents acknowledging the milestone. St. Francis Commons marked the one year anniversary for Oswego County’s only assisted living residence. During a special luncheon for resident to mark the occasion a toast was offered by Helen Yonkers, the very first resident to call St. Francis Commons home. From left are: Karen Murray, executive director; Julie Chetney, director; resident Helen Yonkers; Michelle Smith, health services director; and Peggy LiVoti, activities director. 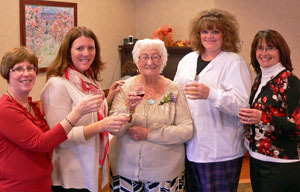 Helen Yonkers, who was the very first to call St. Francis Commons home, took the occasion to say a few words about her experience moving to the area’s first licensed assisted living program residence and then led her 59 fellow residents in a celebratory toast to commemorate the occasion. Julie Chetney, director at St. Francis Commons said that it has been a very exciting year for her and the staff. St. Francis Commons is the only senior care residence in Oswego County offering New York State licensed Assisted Living Program services and amenities. The residence provides supportive housing and care at a level that is less than a nursing home but more than may be found in an independent setting. Services at St. Francis Commons include three meals a day, housekeeping with linen and personal laundry services, scheduled transportation, social programs, assistance with personal care and medication management. Amenities range from a hair salon, gift shop with cable television and telephone connections available in each room. St. Francis Commons is also the only residence that offers Memory Care; a safe and secure neighborhood within the residence serving individuals diagnosed with mild to moderate dementia-related illnesses like Alzheimer’s disease, who benefit from a community-based living environment with supportive services unique to the assisted living setting. Private payment, Medicaid, private insurance reimbursement and Supplemental Security Income is accepted. St. Francis Commons is located at 12 Burkle St., on the St. Luke healthcare campus in the city of Oswego; easily accessible from East River Road (State Route 481), behind Little Lukes Childcare Center and immediately adjacent to Charles E. Riley Elementary School.